You’ve stepped into the world of entrepreneurship and are ready to get your name out there. There’s only one problem: you’ve got a limited cash flow. Thankfully, getting your business up and running doesn’t have to require a huge investment. Read on for a few ways to increase your visibility and sales without dipping into your life savings or taking out a costly loan. Harness the power of the web.​ As recently as the mid-90s, many experts believed the internet was a passing trend, as evidenced by this (in)famous Newsweek article by Clifford Stoll. Thankfully, the experts were wrong. The internet, and specifically its ability to communicate instantly anywhere in the world, makes it the perfect business tool. Pay for premium social media listings.​ A few years ago, Facebook began offering promoted listings starting at $5. For a small investment, you can reach thousands of active social media users in your area or filter based on your target demographic. Facebook and Twitter are both free to use and, even without sponsored listings, are an excellent way for a small business to have a big presence with its customers. Attend trade shows and events pertinent to your business.​ Trade shows and community events are excellent places to get your business noticed. If your customers are other businesses, tradeshows are a gathering place of highly-motivated decision makers where you can gather business leads and network with market leaders. On a smaller scale, craft shows, school fairs, and even farmers markets are inexpensive storefronts or you can interact with local consumers. 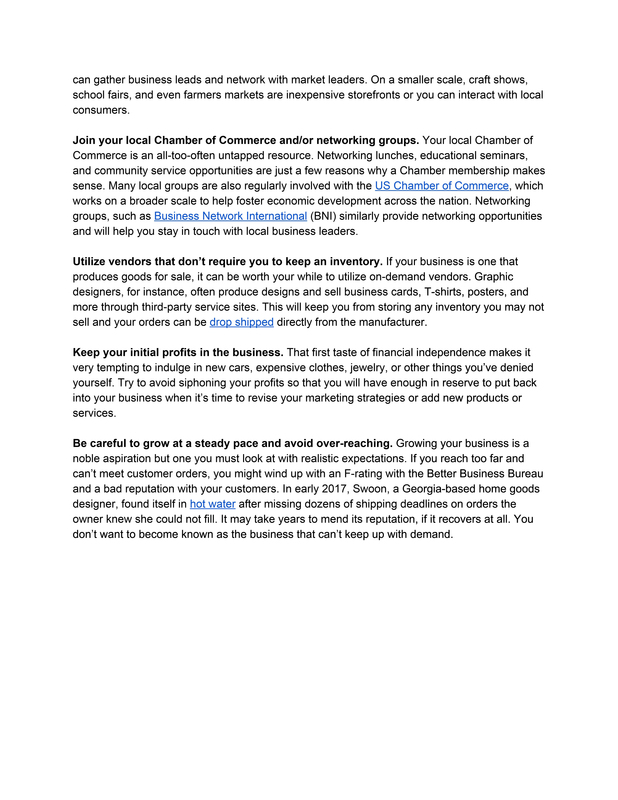 Join your local Chamber of Commerce and/or networking groups.​ Your local Chamber of Commerce is an all-too-often untapped resource. Networking lunches, educational seminars, and community service opportunities are just a few reasons why a Chamber membership makes sense. Many local groups are also regularly involved with the US Chamber of Commerce, which works on a broader scale to help foster economic development across the nation. Networking groups, such as Business Network International (BNI) similarly provide networking opportunities and will help you stay in touch with local business leaders. Utilize vendors that don’t require you to keep an inventory.​ If your business is one that produces goods for sale, it can be worth your while to utilize on-demand vendors. Graphic designers, for instance, often produce designs and sell business cards, T-shirts, posters, and more through third-party service sites. This will keep you from storing any inventory you may not sell and your orders can be drop shipped directly from the manufacturer. Keep your initial profits in the business.​ That first taste of financial independence makes it very tempting to indulge in new cars, expensive clothes, jewelry, or other things you’ve denied yourself. Try to avoid siphoning your profits so that you will have enough in reserve to put back into your business when it’s time to revise your marketing strategies or add new products or services. Be careful to grow at a steady pace and avoid over-reaching.​ Growing your business is a noble aspiration but one you must look at with realistic expectations. If you reach too far and can’t meet customer orders, you might wind up with an F-rating with the Better Business Bureau and a bad reputation with your customers. In early 2017, Swoon, a Georgia-based home goods designer, found itself in hot water after missing dozens of shipping deadlines on orders the owner knew she could not fill. It may take years to mend its reputation, if it recovers at all. 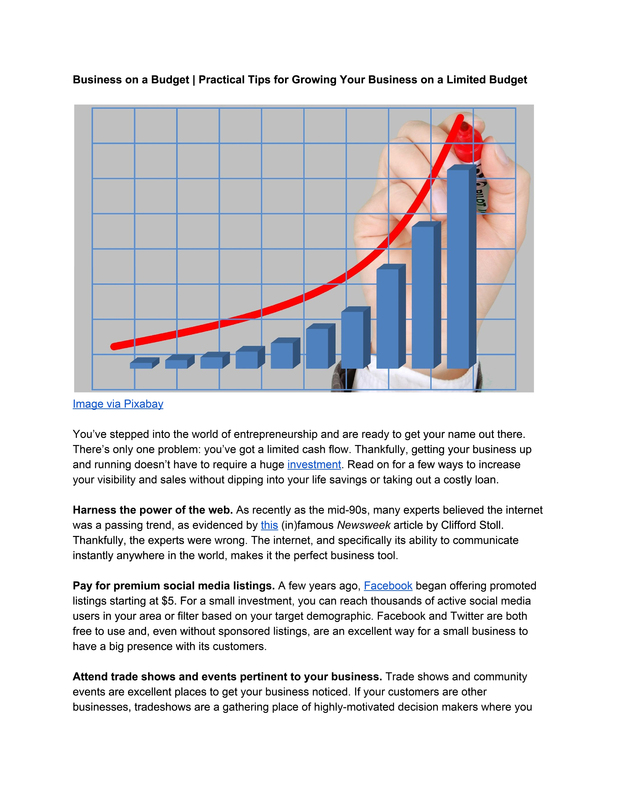 You don’t want to become known as the business that can’t keep up with demand.